Every evening, races are followed by Tech Talks during which students share, oppose and compare their innovative ideas. Let's meet with 3 teams of this second HYDROCONTEST: University of Southampton (England), Australian Maritime College (Australia) et Ecole Polytechnique Fédérale de Lausanne (Switzerland). Among the students studying for their Master's degree at the University of Southampton, there were at least two who knew about the HYDROCONTEST but weren't able to participate in 2014. However, they did not have to wait long before setting the wheels in motion across the Channel. After deciding to join forces with other passionate future professionals within the maritime industry, they formed the first ever British team for the 2015 event, as well as the most international, with members from France, England, Italy, Spain and China. The students, motivated enough to add this ambitious project to the rest of their academic priorities, launched their proposal in December 2014 to obtain the required financial support from the university. It arrived later than planned, but this did not stop the team from completing the design and production of their hybrid boat in less than two months. The team had originally planned to unveil an exciting innovation on the water: a wing, inspired by that of Class C vessels, which was to be installed on the boat like a cover to increase its vertical lift. Although this didn’t work as expected, the boat already distinguished itself with its speed, lightness and innovative design. Without prior testing, it is always difficult to gauge the reliability of a designed prototype – something the team became well aware of when arriving in Switzerland. While the boat was amongst the lightest in the competition, it was at the cost of the solidity of its structure, which appeared to be rather weak and led to various issues during its first tests on Lake Geneva. Luckily no major damage was sustained, and the week's events still left sufficient time for repairs and perhaps a few improvements on the flying catamaran! The team from Tasmania had already caused a stir in 2014 with its flying catamaran, for which it won the “Best Design” trophy. Benefiting from the experience of three members of that year, as well as from the new ideas of five students joining the venture this year, the team underwent months of preparation for the competition. The idea was to adopt and optimise the 2014 concept to better adapt to each competition category. While retaining the boat's hybrid aspect, they also increased its width and fitted it with a mechanical flying height control system, designed to give better stability than an electronic system. They also made the boat more adaptable – equipped with T-foils for the lightweight category, Nancy the hydrofoil became Sid the SWATH for the mass transport category. Relying on the wide range of its members' skills, the team achieved record speeds with its hydrofoil, recording peaks of 25.4 km/h during testing on Lake Geneva. Despite this feat, various technical problems prevented the Australians from matching their 2014 performance during the official races. Nevertheless, their project has undeniable potential and was once again awarded the “Best Boat Design” prize this year. After returning to Australia, succession looks to be assured for 2016, and the team can look forward to perfecting its prototypes between now and the next edition of the HYDROCONTEST. The team of students from the École Polytechnique Fédérale in Lausanne was formed around the Master's project of the team manager, a participant in 2014 and since then a passionate contender in the Hydros Foundation student challenge on nautical and maritime energy efficiency. The team continued working on its two prototypes from the previous year, one a hydrofoil and the other a semi-submersible, in order to perfect these. 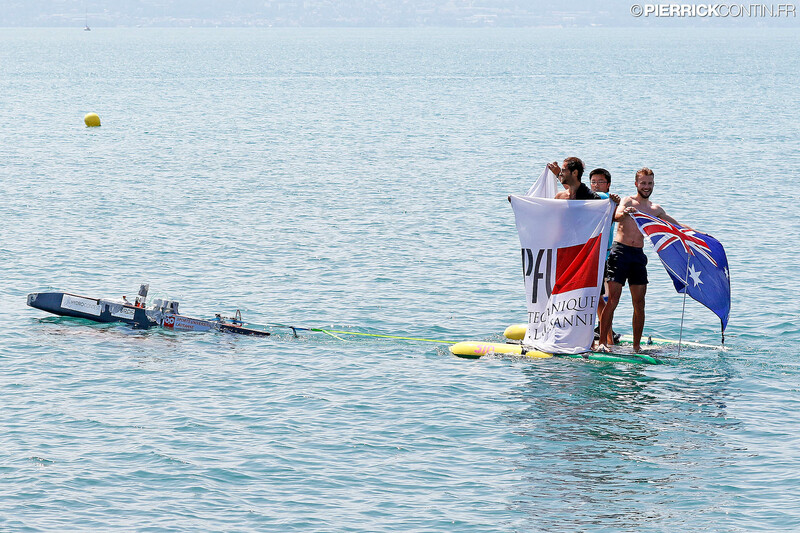 The challenge proved successful for the SWATH, with victory in the final of the mass transport category against the École Polytechnique of Paris, despite the vessel having initially fallen from its launching gantry and the team having given up any hope of competing. The hydrofoil unfortunately lacked stability due to its automated flap control not functioning correctly and was not able to go as far in the competition. Having gained much from the experience due to the multidisciplinary nature of the project, which led the whole team to tackle issues in their respective areas of expertise, certain members of the team seem to have found a new vocation in the HYDROCONTEST. They are now more motivated than ever to continue the adventure in 2016, with the aim of starting from scratch by creating new designs, which they already plan to get started on in the next two to three weeks.